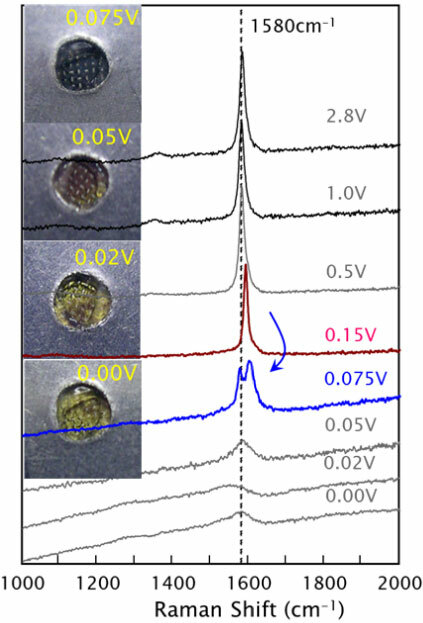 Raman spectroscopy is a useful technique for characterising lithium-ion batteries in research and product development. 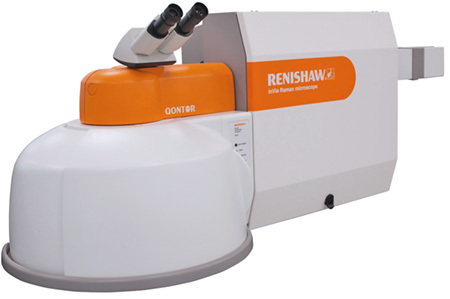 Renishaw’s inVia confocal Raman microscope is ideal for studies throughout the battery development process, from fundamental studies on materials, to final product quality control and failure analysis. Blue Scientific is the official Nordic distributor for Renishaw Raman instruments. If you have any questions, please get in touch. What can you do with Raman Spectroscopy? Detect and identify all materials present, even those at low concentration. These spectra were acquired in situ from: SBR (styrene-butadiene rubber, binder); PVDF (polyvinylidene fluoride, binder); AB (acetyl black, anode); graphite (anode); LCO (lithium cobalt oxide, cathode). 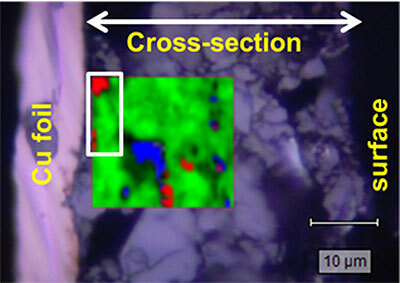 With Raman mapping and imaging, you can study the distribution of materials on electrode surfaces and on cross-sections. This enables correlation of composition and structure with device performance. Discriminate between spatially close components, and detect structural changes. The data can be quantified to give you useful metrics such as fraction estimates and particle statistics. Detecting low concentrations of binder. Raman map of an anode (superimposed on an optical microscope image). Red – SBR styrene-butadiene rubber binder; Green – graphite; Blue – acetyl black. Relative concentrations determined by the map: 1%, 97% and 2%. A wide range of sample chambers, electrochemical cells and inert gas glove boxes can be used with the Renishaw InVia for in situ analysis. Data acquisition can also be triggered by other devices, including potentiostats, for in situ and operando measurements. changes, indicating intercalation of lithium (shifting the peak to higher wave numbers). The peak-splitting indicates the intercalation penetrating the interior layers, rather than just boundary layers. Courtesy of Prof. Y. A. Kim, Shinshu University. The components of lithium-ion batteries can be affected and damaged by high laser power densities. The InVia has line-focus laser illumination technology to reduce power densities and prevent sample damage. The total laser power is maintained, giving you the same high quality data at high speeds, without altering your sample. With the inVia you can detect materials that are present even at low concentrations, such as binders, with high sensitivity and spatial resolution. 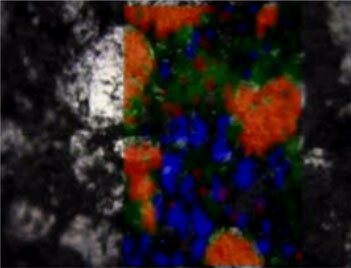 Raman map of an anode, superimposed on an optical microscope image. Red – graphite; Blue – acetyl black; Green – hard carbon. Relative abundances: 13%, 10% and 77%.